Is there anything I can do to change this? Am I doing something wrong? I'm running vanilla 2.3.1 and I do have an SSL certificate for my site. 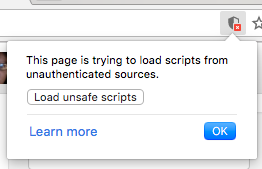 When you load any non httpS scripts it breaks the security. Try just adding the S to the external script file. Mind linking me to your site?